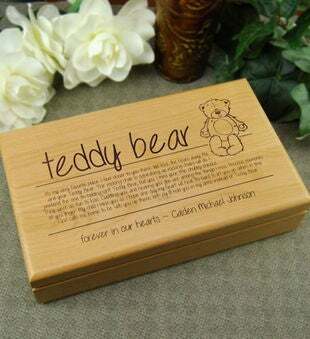 Our Teddy Bear Keepsake Box is a the perfect place to keep your loved ones mementos after they have passed away. With your personal touch and a beautiful poem engraved on the box, a keepsake box is a meaningful sympathy gift. With your personal touch and a beautiful poem engraved on the box, a keepsake box is a meaningful sympathy gift.